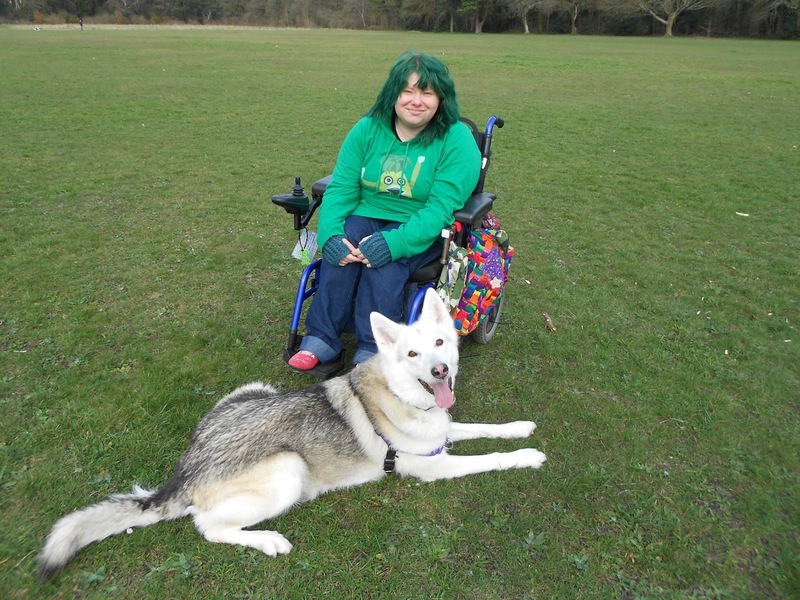 Freya is my current, in-home assistance dog. She’s a Northern Inuit Dog, the breed originally used in Game of Thrones to represent the Direwolves, before they switched to using CGI. The breed originated in England in the 1980s. The original groups representing Northern Inuits wound up splitting off into different factions because they couldn’t agree on how the breed was founded; some think it was by crossing wolves with German Shepherds, but then only breeding those crosses with each other, while other people think it was by crossing Shepherds with other “northern breed” dogs. Nobody actually knows for sure, and even if there is wolf content, it is incredibly diluted by now as to be non-existent. NIs have become my favourite breed of dog (but I’m a dog lover, so I’m also partial to a chocolate Labrador, a Maremma, an Irish Water Spaniel, an English Setter, a Corgi . . . most dogs! ), because my time with Freya has truly endeared them and their traits to me. We adopted Freya from Margaret Green Animal Rescue on June 19th 2011. This date was also apparently her 2nd birthday. We’re not sure if that’s actually true, as a lot of her paperwork was quite dodgy and Tippexed over, but we celebrate it on that day anyway. Freya had quite a history when we got her. She had been abandoned at least once. We’re not sure precisely how, but she was very nervous as we were packing up the boxes before we moved, so it may be that she was left in an empty house. Her most recent owner, the one who turned her into the shelter, had three German Shepherds alongside her. They admitted to only walking and interacting with the Shepherds while leaving Freya alone in a crate at the back of the house. They got fed up with her howling, so they got rid of her. Allegedly, they fed her straight off of the floor instead of from a bowl, as the shelter said that she wouldn’t eat from one when they gave it to her, but she did eat from ours when we took her home, and she has since. I fell in love with Freya the moment I saw her. 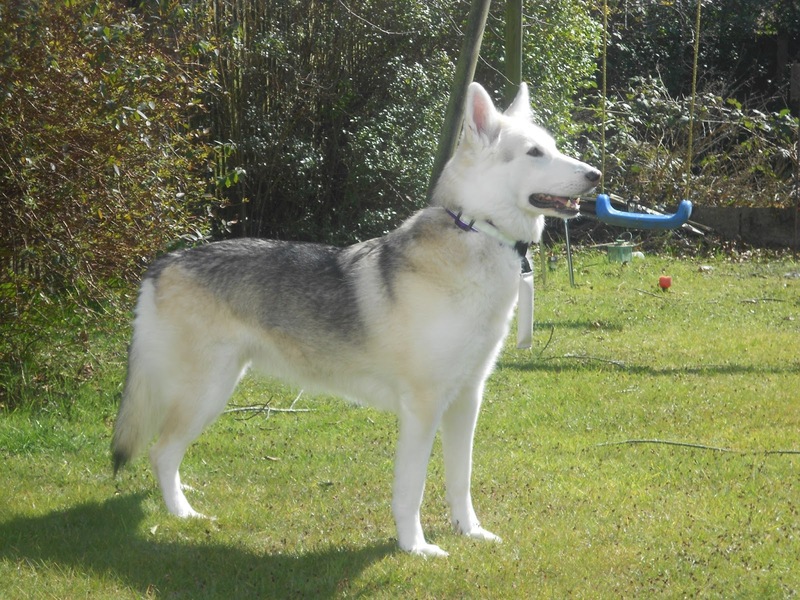 We were originally interested in another Northern Inuit at the same shelter, but he was taken. A while later, my partner Will got a call about another one coming in. Apparently, the shelter sees an influx of them quite often. More people are becoming interested in unusual northern breeds without understanding their care needs, and it ends badly. We decided to take Freya, and Will had to make multiple visits to her before we were allowed to bring her home. Without anyone being available to drive him, he had to take long bus journeys and then walk the rest of the way down country roads without pavements, covered in deep puddles that got his jeans wet up to the calves. We were very serious about Freya! She was understandably very nervous when we got her home, and toilet training went out the window for a while, so to speak, as it always does when a dog experiences a change like this. She was very afraid of my walking stick and used to shy away from it. She used to lean back when anyone reached to touch her. She was also scared of my wheelchair, but with training, she got very comfortable. Too comfortable, actually; she eventually lost the instinct to get up out of my way whenever I was wheeling towards her. I can’t quite remember how I began to teach Freya things, but I know it got about three times faster when I discovered clicker training. She learned to do more than I ever imagined she would. My primary disability causes joint dislocations, and subluxations (partial dislocations) from normal everyday movements. You name it, I’ve dislocated it, in fact it’s probably popping in and out of place several times a day. Those pops are very painful, and also make for a lot of torn blood vessels and skin. She also has a way of alerting me when I’m hallucinating and even I’m not sure how it works. I have Psychosis, and hallucinate quite often. It can be something as benign as a pattern moving across a wall or some curtains, or as severe as seeing an actual shambling corpse walking around my house. In the fright that can happen at times like this, it takes me a while to remember that I hallucinate. Freya developed the very strange habit of approaching me and moving her head underneath the palm of my hand, and just standing there, with my hand on her head. This is not how she would usually ask for attention. I’m not sure how it works, but it does, and it helps me realise that whatever I’m about to see or hear isn’t real, and to get myself to somewhere I can feel safe. If I think I see someone standing in a corner of a room, I can ask Freya to go and greet them. She won’t, because they are not real and there are no belly rubs to be had. This is somewhat reassuring, even if it does look like somebody is staring at me. I was diagnosed as Diabetic a few years ago. Originally, I was told I had Non-Diabetic Hypoglycaemia, but a glucose tolerance test in hospital showed that my body did not react properly. I was classed as Type 2, because I still had some pancreas function (namely, a sudden burst of far too much insulin, causing dangerous hypoglycaemia). Now my consultants aren’t actually sure what type I best fit into. Hypoglycaemia (not enough blood sugar) and Hyperglycaemia (too much blood sugar) are both dangerous. Brain, eye and organ damage occur from being in either of these states for too long over time. It is even possible to fall into a coma and die. Unfortunately, unlike the majority of diabetics, I didn’t feel symptoms when in either of those states. Dogs were becoming known for literally being able to pick up the scent being released by the body during blood sugar changes, when this happened. I was asleep in bed one night when Freya hopped up on top of me and wouldn’t go away. She kept sniffing in my face and wouldn’t get off of me. Something drove me to go into the living room and check my blood sugar. It was shockingly low and I would have died if she didn’t get me out of bed that night. It was a week or so before Christmas and, if we never had Freya, my partner would have been burying me. Freya started to react more often to other blood sugar levels. Her instinct was to lick my palms and arms, which worked for a while, but because diabetic attacks make you feel quite disoriented, over time I stopped feeling like I had to act when she did this. We tried a series of different alerts, from pawing at me, dropping into a down stay, picking up a detached bringsel and showing it to me, and finally, wearing a bringsel on her collar and lifting it in her mouth. This took training with samples of my own scent taken during attacks. My blood sugars have stabilised quite significantly over the last year and I now need alerts so rarely that Freya no longer has to wear a bringsel. In fact, her bringsels are in use around the house as door tugs. We don’t know why this has happened, and it may well get worse again, but it’s very freeing to not have to cling quite so tightly to my dog in fear for my life. There are still more things to explain about my body! I also have Dysautonomia; in summary, things that should be automatically regulated by the body (heart rate, temperature, blood pressure, when to be conscious and when not to be), just aren’t. My pulse and blood pressure get both cripplingly low and high for no reason or as a completely inappropriate reaction to whatever did happen. I faint, even when already sitting or lying down. I get boiling hot or freezing cold at odd times. Sometimes I have little or no vision in one or both eyes or I can’t use one hand. This is a secondary condition caused by my main connective tissue disease. The types of Dysautonomia I have include Postural Orthostatic Tachycardia Syndrome (POTS) and Orthostatic Intolerance (OI). I had to have a tilt table test to officially confirm my diagnosis. At my first one, I went temporarily blind when I was lifted up on the table, and almost vomited. 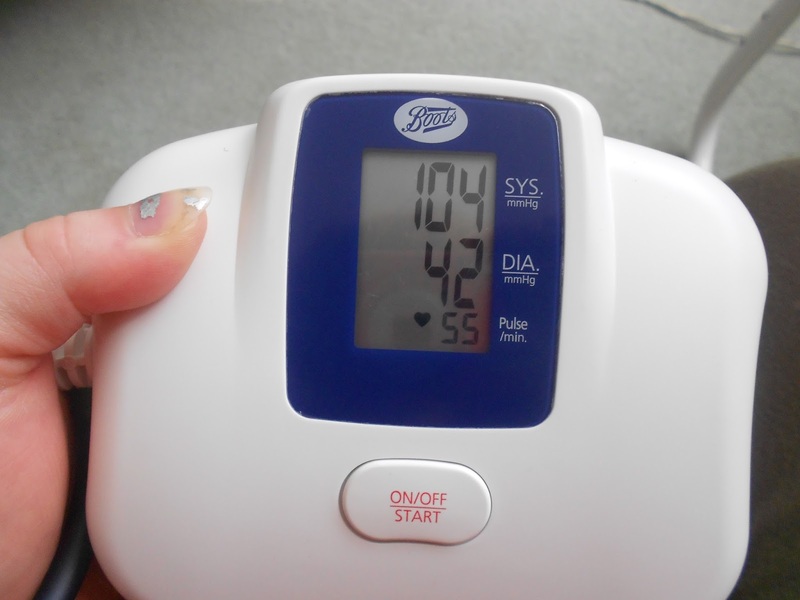 When I was finally brave enough to return for another test, it showed that my blood pressure plummeted, and my heart rate is constantly bouncing up and down between 70 and 109bpm. It sometimes gets as low as 40. I fainted on the table and they brought me back down. Sometimes, when I fainted, the last thing I would remember would be Freya solidly staring at me beforehand. Dogs can allegedly hear the heartbeats of prey like mice from a short distance away, so I wondered if she could hear my heartbeat as well, or maybe the body releases a scent when something is making me faint. I don’t know how she knows. Over time, I managed to train her to drop into a down stay when I saw her staring, before I lost consciousness. She started to do it without prompting, and if I acted quickly, I could climb down to the floor myself before collapsing. That’s the short version, anyway! She also seems to know if my blood pressure is wonky or I have a low pulse, and she will come and sit on my legs to discourage me from getting up. In summary, Freya has been completely amazing to me. I wanted so much for her to be able to get me out of the house, to help me get items from shop shelves, and start living. 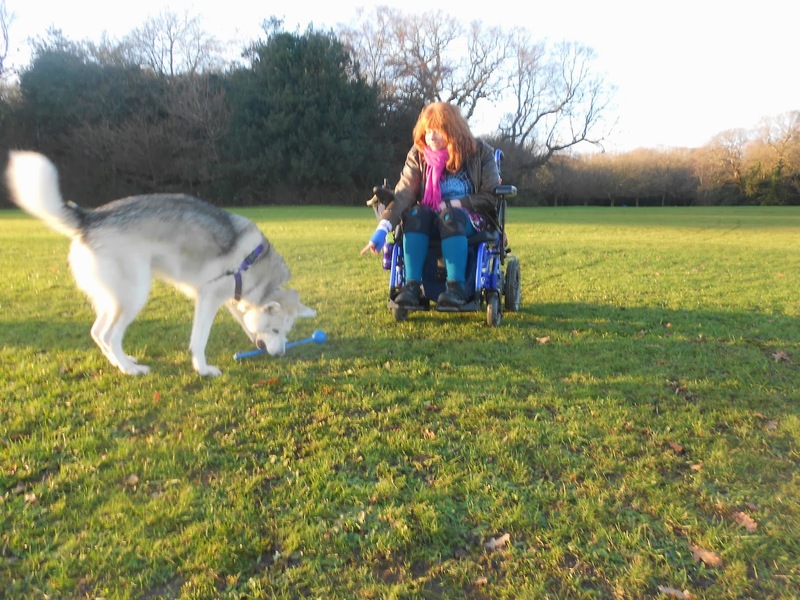 It was hard to teach Freya to heel next to my wheelchair, because when she did want to pull on the lead, it would dislocate my wrist or elbow. I desperately needed the support of one of the charities who will train a disabled person’s existing dog to be a Recognised Assistance Dog. Sadly, they had no space and wouldn’t take her on. We waited, but they won’t train dogs that pass the age of 4, and Freya passed it. She really deserved the recognition of being a Recognised Assistance Dog but it just wasn’t to be. Along with the things Freya had already been through before the age of two, more bad things happened during her time with us, she is now a very nervous adult, and so even if a space for her were to magically appear, she is no longer suitable to ever work in public. Our previous neighbours were very awful people with an awful dog. They held dog fights in their garden, which none of the authorities cared about even when pictures were taken. Their dog was left outside day and night, barking his head off. When we moved in, there was just a hip-height brick wall, which was obviously no good. We had an additional fence put on top. One day, in a bad storm, some of it tore down. My partner and I went out to try and put it back up, and I brought Freya out on a lead, because of the hole in the boundary. The neighbour’s dog scrambled over the wall, made a beeline for Freya, and tore her to shreds. My partner managed to get her inside and shut the door, but even though the dog bit us too, no action was taken by the authorities again. The neighbours stood by watching during the whole attack. 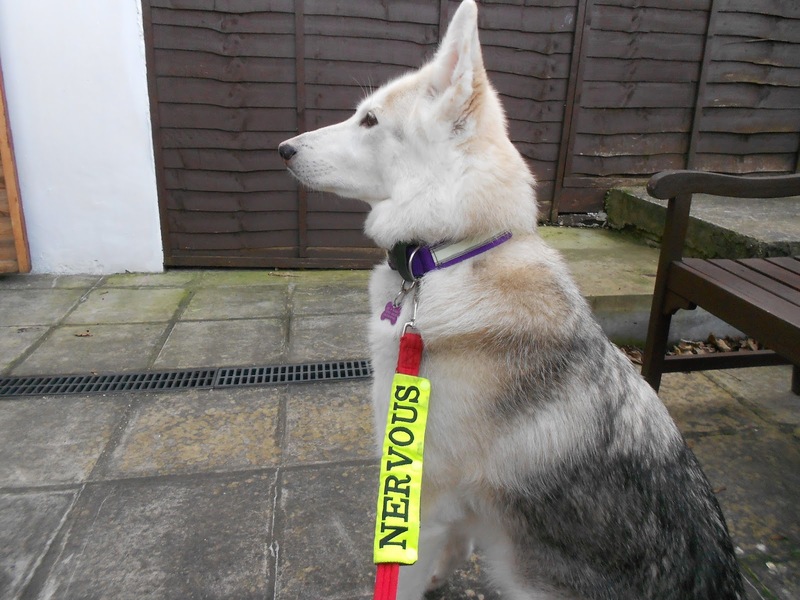 Freya now wears this “Nervous” lead sleeve in public to let people know that she will be stressed if they or their dogs approach her. This turned Freya very leash-reactive, and she has been attacked by other dogs time and again since then, though thankfully no more of the incidents were in our own garden. Dogs very often make a beeline for her when she is out. The usual culprits are Cairn Terriers and Westies, dogs that, because of their small size, the owners simply don’t believe they need to train. One dog ran right up and bit Freya in the face. 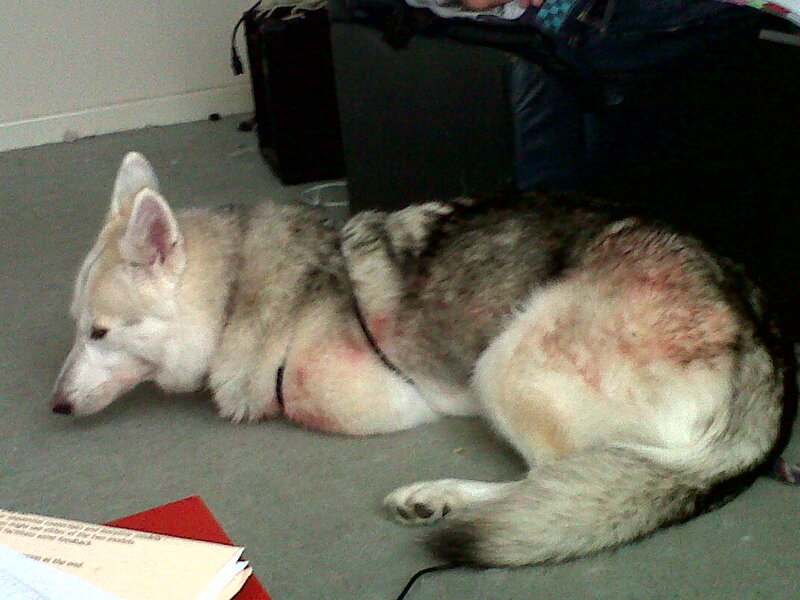 The owner responded by grabbing her dog and repeatedly hitting it in its own face. Another time, a Jack Russell came over and started biting her in the neck. 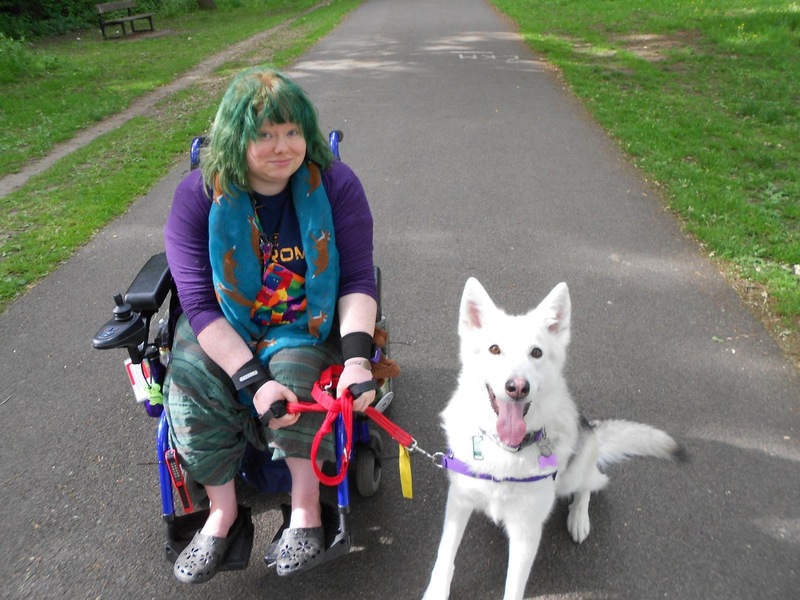 The owner only intervened after she saw the old yellow “Give me space” ribbon on Freya’s lead, and said she would have stopped her dog sooner if she had spotted it. Apparently, dogs who don’t publicly declare having been traumatised by previous attacks, are fair game for this woman’s dogs. Freya is now totally unsuitable for public work, even if the opportunity were to be available. But she is a fabulous in-home assistance dog. She has been so good to me and I wouldn’t be alive without her. I still want to get out of my house and live life, and I’m not healthy enough to train my own dog from scratch again, so I’m waiting for a Canine Partners dog. I should be tapering off the work that Freya does, so that she has no desire to compete with the new dog, but there is still so much I need from her around the house. 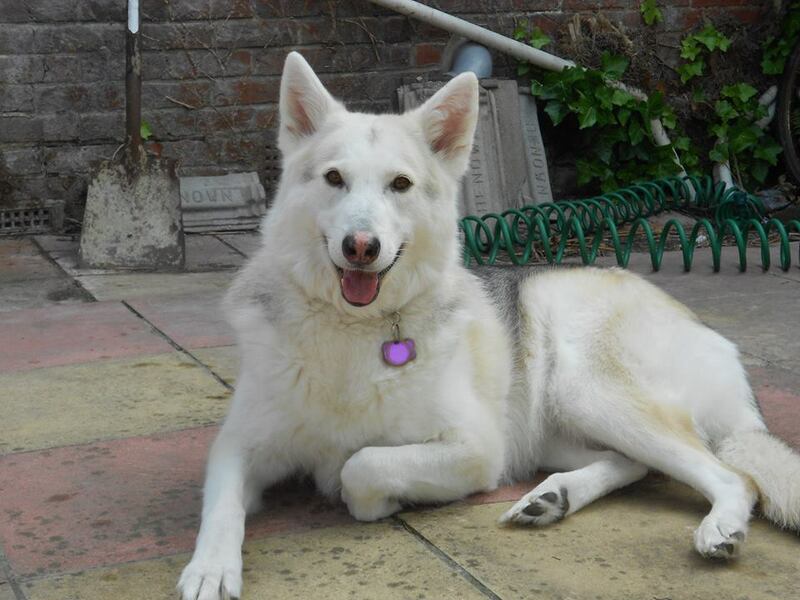 Freya will turn 7 in 2016, which is quite old for her breed. She has been through a lot in her time, and I only hope she can be happy in this house we’ve found, and retire peacefully. We love her with all our hearts, and I hope she feels it.